Sometimes – if you’re lucky – you can capture this mood on record. The actual time of day (or night) that the recording takes place doesn’t matter much. If the atmosphere is right, the participants sympathetic to one another, and the choice of tunes felicitous, three in the afternoon can be “After Midnight” in mood. It was like that for this album. Capitol’s new Tower Studios set the scene and all the conditions were right. At every session the prevailing atmosphere was “After Midnight” all the way. This album is Nat Cole’s first with his small group in some time. Long before he was known as a singer, Nat was one of the best of all jazz pianists, winner of Esquire Awards in 1946 and 1947, and top man in the Metronome poll in 1947, ‘48, and ‘49. The “King” Cole Trio won numerous honors too in capturing the Down Beat poll from 1944 to 1947 and the Metronome poll from 1945 to ‘48. The Trio is an historic group in the saga of jazz and popular music in America. It is common today to see trios of piano, bass and guitar working in hotels and night clubs all over the country. Did you ever stop to consider that the “King” Cole Trio set the pattern for these groups? Until its success, no agency would book, and almost no night club would hire, such a small combination. When Nat first went looking for an agent he was told time and again the group was too small. “You’ve got an awkward combination there,” they’d tell him, but Nat kept on. “I knew they didn’t know what they were talking about,” he says, and history had proved him right. 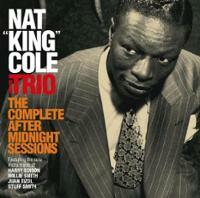 The “King” Cole Trio’s story has also been interwound with Capitol Records. They made their first Capitol discs in 1943, when the company was a healthy youngster. Their second disc, Straighten Up and Fly Right, was an instant and tremendous hit. Since that time Nat “King” Cole (born Nathaniel Coles in Montgomery, Ala., in 1919, son of a Baptist preacher) has become one of the top names in the entertainment business and one of the biggest selling recording artists of all time. One of the great jazz piano players when he began the trio, Nat has now become one of the great ballad singers of our day – known throughout the world. And he is still a great pianist: witness his work on this album. Nat is accompanied here by his regular group – guitarist John Collins, a veteran of the Art Tatum and Dizzy Gillespie groups and also an Esquire New Star winner; bassist Charlie Harris, who played with Lionel Hampton before joining Nat; and drummer Lee (Leonidas) Young, brother of the great Lester, who has worked extensively in motion picture studio orchestras and is also a veteran of the Lionel Hampton band. On Caravan and Lonely One, Jack Costanzo sits in on bongos. A guest soloist joining the group on each tune is an arrangement that adds a little extra spice to the album – just as visiting musicians might drop by at a club after midnight and play a tune with the group. This particular sequence of guest stars fits especially well with the voice and music of Nat Cole. Copyright 2016 Jay Livingston Music,Inc.